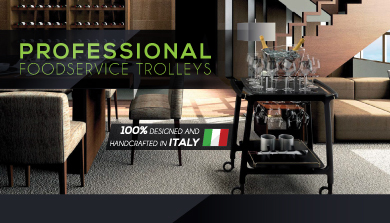 The classic service with Italian designed trolleys experiences a renaissance. A retro trend in fine dining, which finds its way back to Gueridon, Cheese, Dessert, Wine, Champagne, Cocktail, Tea and last but not least Flambé Trolleys. Made of solid wood in MGR Veined grey, Walnut, Wengè or colours at your choice. Dive with us into the wonderful world of classic Crêpes Suzette service at its best, combined with timeless Italian Design.